If fans' confidence, as measured from the social media is taken as a yardstick, Barcelona would more or less thump Real Madrid at Camp Nou this Wednesday. They expect it to be like the first Clasico of the season, where Barcelona thumped Real Madrid 5-1. Nothing can much further from the truth! Despite having a horrid season, even by considering their last Liga season, Real Madrid still remains one of the best toughest teams to face when it comes to cup competition. They are so good at winning those crucial moments in matches and especially in a two-legged tie, those become crucial. Without any doubt Barcelona start as the firm favorite, even though we have to play the second leg away from home. And for Barca, it will be considered a great disappointment if we do not make to the next round. But if Barcelona players showcase the kind of complacency which some of their fans are showing, they will be in for a very tough match. Real Madrid has to be taken seriously and everything will depend on how we fare in the first leg. For Barcelona, Lionel Messi, as usual, will be the biggest weapon. Whenever we play Real Madrid, the little Argentinian naturally raises his game and the fact that he missed the 5-1 destruction of Real Madrid earlier this season, he will be extra motivated for this match. And that will be Barcelona's biggest advantage going into the match. There has been some question raised about his availability after he picked up a slight injury. But going by the news from the dressing room, he will be definitely available for this match. Real Madrid has seen an improvement in their form and results in the last few weeks. One of their highlight players has been Vinicius Junior. Vinisius' pace has been quite a weapon for Real Madrid and Barca need to negate that. The easiest way to do is to have the Right Back push further forward and link with Messi on the right. That simply will cut off the young Brazilian out and Barcelona would behaving a peaceful night. 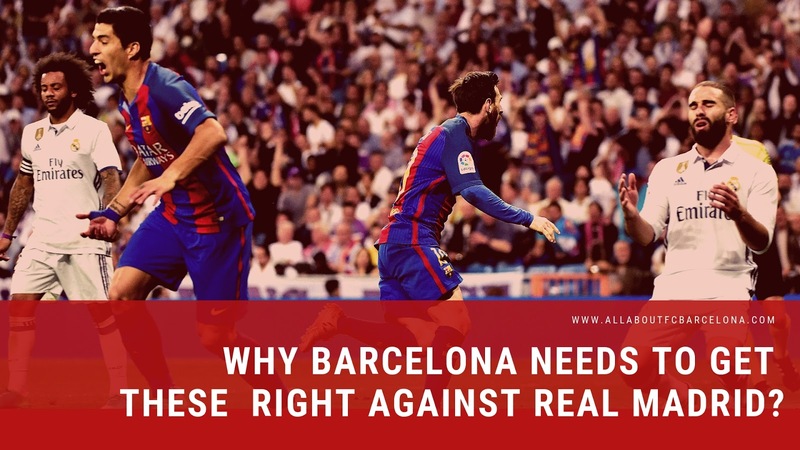 It is essential for Barcelona to run the game through the right and with Alba arriving late into the box, Messi can switch and stretch the Madrid backline at will. Without a doubt, Barcelona should start their strongest eleven. The first leg will be pretty crucial and it will be paramount for Barca not to concede an away goal. A victory without an away goal conceded makes Barcelona's life easier. With Busquets rested, Barcelona will in all probability have a midfield of Arthur, Rakitic and Busquets. That along with a solid defense should make our life easier. Real Madrid will be looking to make the most of the possession they will have. And like in the last league match against Real Madrid, when Real attacks us, we need Coutinho to drop back and defend. That will be crucial for the team as the threat from Real Madrid may come in phases. And if we manage to see out that phase they will simply fizzle out.